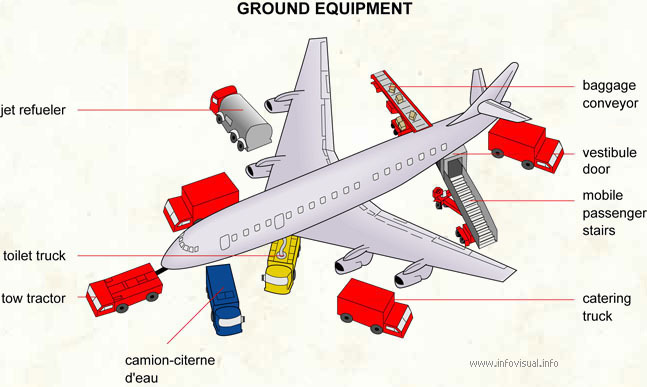 Ground equipment - Visual Dictionary - Copyright © 2005-2016 - All rights reserved. [img]https://infovisual.info//storage/app/media/05/img_en/083 Ground equipment.jpg[/img] [url=https://infovisual.info/index.php/en][/url] - [url=http://www.infovisual.info/]Visual Dictionary[/url] - Copyright © 2005-2016 - All rights reserved. Ground equipment: equipment found in an airport. Baggage conveyor: rolling blet used to transport baggage. Vestibule door: opening in the side wall that provides access to the passenger cabin. Mobile passenger stairs: motorized staircase. Catering truck: vehicle foodstuffs needed for the voyage. Water truck: vehicle with a water tank. Tow tractor: motorized vehicle used to tow aircraft. Toilet truck: vehicle used to carry human waste. Jet refueler: vehicle used for fueling aircraft.